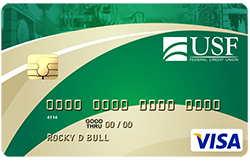 The no-nonsense credit card from USF FCU. For those who like to keep it simple and save, go Green & Gold for the lowest rate available. Ideal for those who prefer to take some time to pay off balances or want to consolidate and transfer balances from higher-rate cards. *APR= Annual Percentage Rate. Credit cards are variable rate, rate may change after account opening. Subject to loan approval. Rate may vary upon individual credit qualifications. Offer not available to current USF FCU Visa cardholders.